Age-related macular degeneration, often referred to as AMD, is the most common cause of blindness in the western world for people over the age of 55. Figures published in the March 2011 edition of the British Journal of Ophthalmology put the figure of the number suffering from AMD in the UK at over 500,000 and set to rise rapidly. In a survey organised by the College of Optometrists, of over 4000 people, around half had never heard of AMD and only 36% of smokers knew that smoking increased the risks of aquiring AMD. The eye is similar to a camera but instead of having film at the back of the camera the eye has a light receiving layer called the retina. In the middle of the retina is the macula, whose function is to do all the detailed seeing for example when reading small print or watching television. When you want to look at something in particular, the eyes move so that light is focused directly onto the macula area. The macula consists of oily substances composed of carotenoid isomers (chemical derivatives) of xanthophyll called lutein and zeaxanthin. 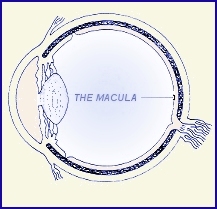 Age-related macular degeneration is a wearing out of this central retina at the back of the eye. The disease is characterised by a slowly worsening of central vision usually in both eyes although one eye tends to be more affected than the other. The side vision or peripheral sight which is essential for easy mobility, is unaffected in this condition so complete blindness does not occur. The terms age-related degeneration (AMD) and age-related maculopathy (ARM) were defined in 1995 by the International ARM Epidemiological Study Group deciding that AMD is the more advanced form of ARM. There are two main categories of AMD  DRY and WET. The DRY form is a gradual deterioration of the central retinal nerve cells and underlying structures and its progression can take many years before causing substantial visual impairment. This is the most common type by far, over 90% have this form of the condition and there is no treatment available. The WET form is a much more serious and rapid deterioration of the central retina and central blindness can occur very quickly. Approximately 20,000 people or 10% of sufferers have this form of the condition and viable treatment options have recently become available. According to a study, smoking one or more packs of cigarettes every day for 40 years trebled the risk of developing AMD and passive smoking doubled the risk after five years. There is a lot of interest at the moment in preventing further damage either by the use of antioxidants or by the use of laser or photo-dynamic therapy. There is a growing body of opinion that suggests nutrition plays an important part in preserving eye health although the results of studies is somewhat unclear and controversial. A study by the National Institute of Health in the USA found that people who ate five or more servings of foods rich in lutein and zeaxanthin lowered their risk of developing AMD by 43%. The use of antioxidants really means eating the right sorts of foods or taking tablets containing various vitamins, minerals and other substances such as lutein and zeaxanthin which are beneficial to eye health. There is a safe dose limit for each vitamin which should not be exceeded. It is thought that vitamins indirectly benefit the eye by promoting the health of the blood vessels. Carotenoids which are concentrated in the retina can benefit eye health by acting as antioxidants and absorbing blue light. Laser treatment is a process of applying a laser beam to the retinal blood vessels to destroy leaking vessels and also burning areas near the macular to protect the sensitive region from fluid seeping out from nearby veins. A small scar usually remains following treatment. Photo-dynamic therapy (PDT) consists of injecting a light sensitive dye (or photosensitising agent called verteporfin or Visudyne) into the blood vessels near the macular and applying red light (689nm) to destroy the damaged and leaking blood vessels. In wet AMD there may be new blood vessels under the centre of the macula, subfoveal choroidal neovascularisation (CNV) and vital cells (the endothelium) are damaged, when the dye complexes with the low density lipoproteins in the blood. The results are said to be better with this technique as there is no damage to the retina. Other techniques are currently being researched but prevention is better than cure. It is quite common for patients with AMD to suffer from Charles Bonnet Syndrome, a condition which is characterised by visual hallucinations. About 60% of patients may be affected and is thought to be caused by a lack of visual stimulation. Many patients assume they are suffering from a mental illness such as dementia or psychosis and may be treated by hypnosis. If the chart is approximately 85 mm wide on your monitor, sit about 25 cm in front of your computer screen or in the same proportion. 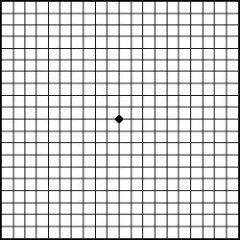 Make sure you wear your glasses for reading if you usually wear them when reading and view the black spot in the centre of the grid with each eye separately. If any parts are missing or distorted it is advisable to consult your optometrist for further advice. This chart should be viewed once per week for normally sighted people and every day for patients with macular disease. If everyone carried out this simple procedure, the earliest signs of the disease would be picked up and if treated urgently the sight could be preserved. On the 27th August 2008 the National Institute for Health and Clinical Excellence (NICE) recommended the anti-VEGF drug, Lucentis, for the treatment of wet-AMD. A scheme has been introduced whereby the first 14 injections will be funded by the NHS, with the cost of any additional treatment being met by Novartis, the Swiss-based drug manufacturer. Mr Andrew Dillon, NICE chief executive, commented that Lucentis was an expensive drug which cost more than £10,000 for each eye to be treated but added that it has been estimated that the cost related to sight impairment for patients treated with Lucentis are around £8,000 cheaper than for patients who receive best supported care over a 10 year period. Where treatment for macular degeneration is not possible you may obtain advice on use of magnifiers and other aids from low vision practitioners. Low vision appliances are available either through the NHS or a much wider choice can be obtained privately. The Macular Disease Society was formed in October 1987 by sufferers of what is now the most common cause of registrable blindness in the UK. The aims of the Macular Disease Society are to provide a forum to disseminate information, ease individual problems, build morale and improve confidence and thus independence. The Macular Disease Society funds research, has an annual conference, provides many benefits to members and has local self-help groups where concerns are aired and ideas on how to solve the problems are exchanged.